DJI drones have simple controls, excellent image transmission, and the power to show us the world as it’s never been seen before. However, not all of their functions are as intuitive as they seem. 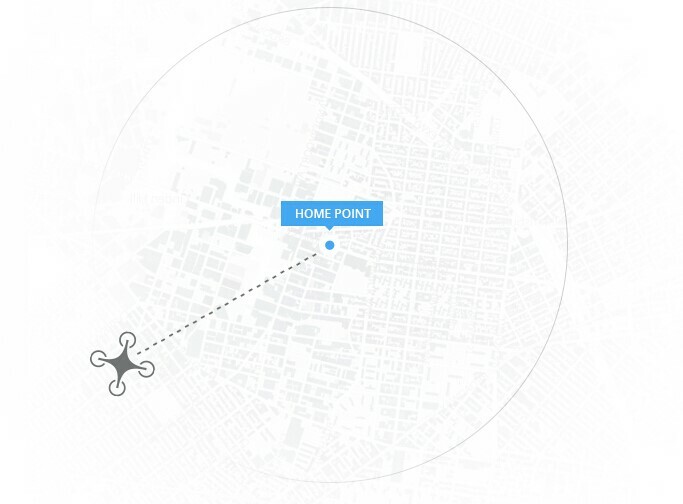 Some users have said that the Return to Home function, one of the touchstone functions of our drones, is in fact a button designed to lose your drone. However, this is certainly not the case. The objective of this article is to clear up some misunderstands related to the RTH button. This illustration from the manual may look a little complicated. But no worries, let take a closer look. What are the prerequisites of RTH? Please take note of your location. There will also be a green H on the map, which means the Home Point is set and the RTH function is ready to use. There are two ’20 meters’ mentioned in the pictures above. One of the measurements is altitude and the other is horizontal distance. 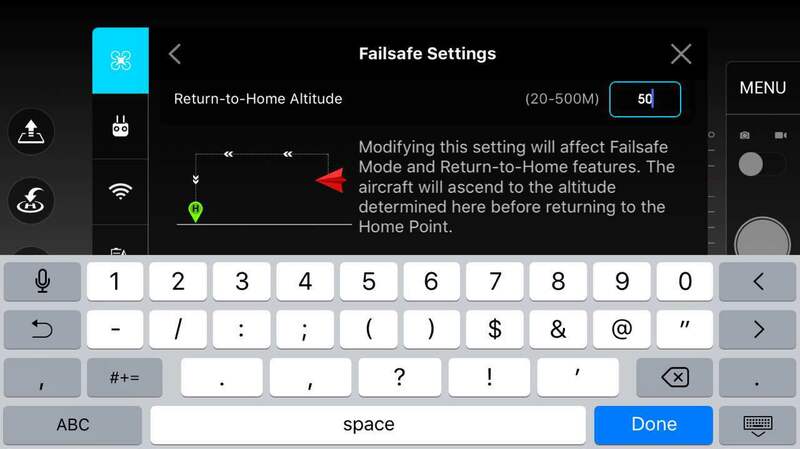 If RTH is triggered below an altitude of 20 meters, the aircraft will automatically ascend to 20meters, since that is the altitude set by default in the app. The drone can’t be controlled during ascension. This parameter can be adjusted in Flight Control Settings > Advanced Settings > RTH.The default value is 20 meters, but can be modified it according to the situation. Please remember that the drone can’t be controlled while rising to the RTH altitude! What is the 20 meters of horizontal distance? The drone automatically lands when RTH is triggered within a 20 meter radius, BUT users can operate the control stick to avoid dangers! PS: If the flight altitude is higher than the RTH altitude,the drone will just turn the direction of the nose and return to the HomePoint. PPS: If the RTH altitude is set as 50 meters and the user pushes the throttle stick, the drone will return at the current flight altitude. It’s easy to crash into something. DO NOT operate the control stick when the drone is returning to the Home Point! In the next section, we’ll look at some examples of crashes and flyaways while using RTH. Remember that the drone will ascend to the RTH altitude when RTH is triggered! Don’t operate the control sticks if you can’t see your drone! Just wait patiently for it to return to you. Make sure you record a Home Point before flying. Remember, the drone automatically lands if RTH is triggered when the drone is within a 20 meters radius of the Home Point. Unlike in the previous case, use the control sticks to stop the drone from descending! Please remember to set the Home Point before using RTH and wait patiently during the return. DO NOT look for the drone anywhere else. Also, please remember to set the RTH altitude. Lastly, hope all of you have a great time flying! Got the P3S at Xmas. Haven&apos;t used it yet as I&apos;ve been logging some time on the sim. Going to attempt first flight today. Reading multiple threads on the RTH and flyaways, I was getting a bit confused about the exact parameters of the RTH function. Great post, thanks for clearing it up! Seems like it would be fairly easy to change the code in such a way that a user initiated rth would function as normal, while any other rth condition would not take control away from the pilot at any time. If I initiate rth, presumably I will know it is safe to do so. The autonomous rth triggered by, for instance, out of range or battery low should not override pilots commands. Especially on the Standard, because it goes rth at any range unpredictably for just long enough for rth to initiate, then gets signal back, inexplicably. This is an awesome post but also outlines potential dangers and a separation of control from the operator and UAS. Tim, good article! Why not allow the operator to over ride via the sticks the initial assent when outside the 20 meter radius of the home point? Also, if you move the sticks when outside the 20 meter radius and at the RTH height, what will happen? Do they still work but slows down the RTH timeframe? It sounds like sticks will still work when inside the 20 meter radius, but will their movement slow down the RTH timeframe? ... and for that reason alone, RTH is fail-UNSAFE !!!! What you are describing is the same as trying to say that a Phillips head screwdriver should be used on all construction jobs. What about when you need a slot-head, maybe even to pry but you do not want to risk a chisel blade? No slot heads, no slot heads! You are told in the manual how the P3 works, and how RTH works, and that information is being repeated here with further clarification. So many fliers have claimed fly-aways and crashes because they did not read or did not understand what they read in the manual. That is a very real problem for any manufacturer of UAVs, cars, planes, boats, bicycles, etc., not just DJI. Tim is at least trying to help you and others understand how the system works. The important point here, that was not addressed, is that under some conditions, the circumstances of the flight environment will take control of the P3 away from the flier. DJI has no control over that. Only the flier has control over that. The flier gets the P3 into trouble. When trouble happens, DJI has tried to implement a set of means to save the P3. If you reject those means DJI has tried to implement to save your P3 - well you can see where that will get you. Where does the flier&apos;s stubbornness meet ignorance in this scenario? So where does personal responsibility come into play here? Is DJI responsible for your own failure to act in a responsible manner? I think not. DJI has actually designed a means to keep out of your way when you screw up, but you have to be able to read the big letters on the wall to save your P3. Control is given back to the flier, if asked, at almost every stage of the various DJI RTH scenarios except when transmission and reception is lost. How can DJI keep the flier in control when there is no communication between the flier and the P3? That is what you are asking. At least DJI enables the flier to still control the altitude of the P3 and the Home Point when there is no communication. But the flier has to understand this. Now go and enjoy the holiday and put some though into this and maybe reread the RTH parts of the manual as if you worked for DJI and designed the RTH function. Then become a flier again and think if you can save your P3 in different forms of trouble. The solutions are not that hard to figure out and they do not require that DJI start a Black Magic division. Just fly safe and Happy Holidays!!! Also can anyone tell me how the return to home works when it is set to &apos;follow&apos; does it still just return home point or return to pilot? Same goes for way points, can I set it off going on the way points and then lose signal will it just continue or will it just stop and return home? The only thing I could think would be nice is a longer period before RTH kicks in, either be able to change the time or maybe it can work out how much battery it needs to get home and will just stay still until it has minimum battery at that point it will RTH? that way if you fell asleep for 5 mins in the forest mid flight it would still be hovering where you left it, or if you lost signal while flying under a bridge you would have time to reposition yourself under said bridge to get control back. I agree. It sounds like the OC (original complainer!) wants the RTH to work the way he wants it to work when he wants it to work. The part where he wrote ...flying through a tunnel..." is intriguing and creates a logic conundrum. You&apos;re going to fly into a condition where you do not want the auto-RTH function to work the way you expect it to work, but once you&apos;re out of the tunnel you want it to work normally? Sounds like the mythical software/hardware control known as "...yeah, but this time I really mean it!" If you can effectively turn off the auto function, you&apos;ll also need to know when the auto function needs to be turned back on. Doesn&apos;t that turn an auto function into a non-auto function? The best I can see at that point is that you have the ability to totally disable RTH for that particular flight - you fly the whole thing manually. Turn off the GPS? Once that&apos;s done, finding the home point, activating RTH, etc., becomes very problematic. From my viewpoint, I see no easy solution. When RTH is triggered by loss of signal, it has to act autonomously - because you have lost control signal. Maybe you can set it to just hover if signal is lost, so you can get in a better position to regain control signal, and resume flight from there. 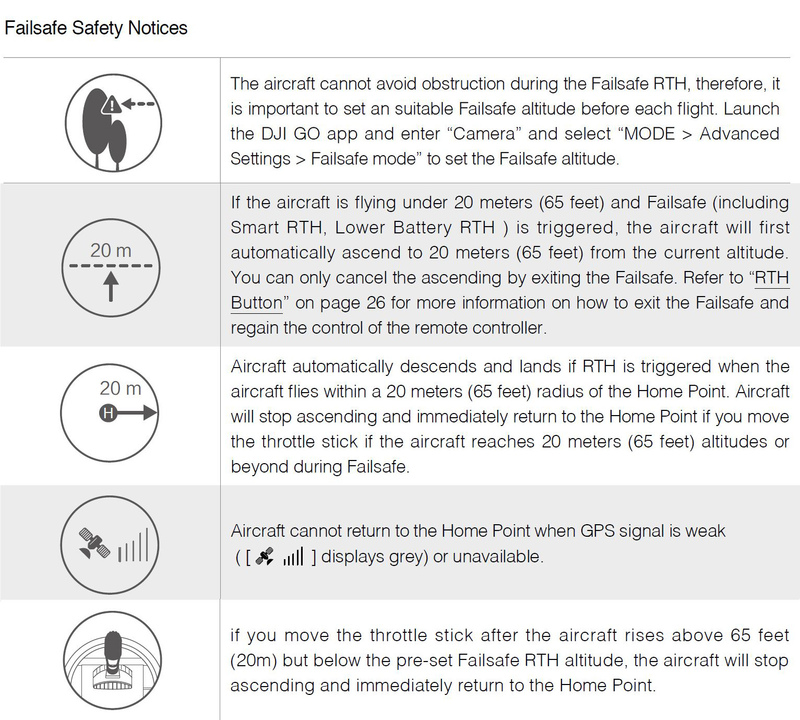 Phantom 3 Professional User Manual - "If the aircraft is flying under 20 meters (65 feet) and Failsafe (including Smart RTH, Lower Battery RTH ) is triggered, the aircraft will first automatically ascend to 20 meters (65 feet) from the current altitude." Firstly, is the 20m from the current altitude referred to the altitude I set in the app? If yes, then if I set my RTH value to 30m, will it ascend to 49m if it&apos;s currently at 19m? What if it&apos;s at 21m...will it ascend to 51m? I don&apos;t understand why there&apos;s a difference if it&apos;s flying above or below 20m at the time RTH is triggered. There are three options since FW1.3 for what to do in the event of a loss of signal. OK, you do not seem to be getting the picture here. First, are you in the right forum? This is a P3 forum, but you sound like you belong in the Inspire forum. Now, I will gladly admit that the P3P is about as close to an Inspire as a P3S is to the P3P. So maybe there is a work-around available here. But, it does seem that here we are talking about P3s, which appear to be working fine with RTH functions, and then you bomb the discussion to note that you are talking about apples when we thought we were all talking about oranges like everyone else in this forum. That said, let us proceed with the inspired discussion. "There are three options since FW1.3 for what to do in the event of a loss of signal. RTH / Hover / Land in situ. If you choose "Hover", you will have time to reposition yourself in the event of a loss of contact due to an obstruction." This is the whole point - "loss of signal". You decided you do not want to hover or land and thus avoid crashing into a ceiling. That is your choice. You are the pilot and you are choosing an option that you know will make your aircraft beat its head into the brick wall over head. In a way, you are in control of that stick when your aircraft smashes into the ceiling because of your earlier choice. You are not supposed to be flying under a brick ceiling, especialy if there is the potential for "loss of signal" and you know you are in RTH mode. In the US, a helicopter has no altitude limits (other than physical) and the pilot can land anywhere. But if there is a use of faulty judgement and an inccident occurs, the pilot can lose their license. Now, to give you control of the stick when there is a "loss of signal" is one definition of black magic. Some people like to think of computer coding as black magic, but I can pretty much guarrantee that if you can figure out how to give a pilot a "literal" control of the stick when there is a "loss of signal", you will end up more wealthy than Bill Gates. But you do note that you have three choices ahead of time should your aircraft experience a "loss of signal". To be a responsible pilot, especially a helicopter pilot, you are required to anticipate your flying environment. In that anticipation, you are reminded by DJI to address RTH questions, particularly altitude. It is up to you as a responsible pilot to figure out which option to use for the current flight. You may use a different option in the next flight so you can get a different angle on a subject with a different risk of "loss of signal". You are using a current technology, not a dream technology that does not exist yet. You have to fly in the real world. That is your flight environment and loss of signal can be a real problem in that environment. Then you note Inspire problems that do not appear to be problems for the P3 and address coding issues. DJI has a developer program and it even has a developer forum. It appears that DJI welcomes solutions like you are proposing. Is there something obvious here that we are missing? It does sound like you are so busy and behind deadlines that you do not have time to solve the problems DJI has in your perception of the situation. I suspect that it is possibly an ambiguous choice of language. It has a sim, yes, but not sure how much detail it gives. I&apos;ll be trying it tomorrow. No... You are missing the point. You are failing to notice that it is the pilot who is creating a flight environment where the pilot will lose control over the aircraft. This is not responsible flying. For example, your motorbike scenario with the tunnel. The pilot was obviously irresponsible because they flew outside the limits of the battery and put the aircraft into low-battery RTH. Low-battery RTH has specific characteristics that you need to respect and use to your benefit, not deliberately create more problems. Plus, my experiences (very limited) with low-battery RTH allow me to cancel the low-battery RTH and fly home, but then I am in the right forum and talking about the P3 not the Inspire. You are not addressing a RTH function. You are talking about flying back to the home point manually - so just fly back manually! It is one of the most fun parts of flying the P3. In my P3, if I go into connected RTH and change my mind, I just cancel the RTH and fly home. Very easy. Did DJI prevent the Inspire from doing that? Every time I get a low battery RTH, I cancel it and blaze home because I can. I am not arguing for a complete removal of RTH - Please don&apos;t misunderstand. "If the signal is lost, then the pilot has no control anyway and the point is moot but what if control comes back during ascent? The pilot will still not be able to arrest the ascent or side-step an obstacle such as an overhanging branch. . . .
As long as the pilot has the control unit and the control unit has a connection to the aircraft, the aircraft should always respond to the sticks. ALWAYS without exception . . ."
You seem to be implying that the RTH function is in control when there is communication with the P3. But in the cases you are noting above, the pilot is always in control. If the P3 goes into RTH for whatever reason and your RC is in communication with the P3, all you have to do is press the RTH button once to cancel RTH and if you are not touching the sticks, your P3 will stop and hover. The secret is the RTH button not the sticks. The sticks come after the button. Maybe that is why you cannot see the problem properly. Put that in your tests so you can put it in your manual since it is already in the DJI manual. Now if your Inspire will not do that, you should sell it and get a P3P. They are great fun to fly! No, no, no, not so. So you are saying you have a faulty battery and or update. So get it fixed. That is what we do here in P3-land. "Should" but "Does not" is what should be read by my statement. The Go app warns you that the bird is going to go into "whatever" - RTH? With the advanced warning, you can prepare for whatever you want to do next. The RTH "panic" button is not over there but is in fact front and center - real easy. As the pilot seeking to fly safe, you are required to make sure you do not go into a low battery RTH unsafely and if it goes into a low battery RTH at 50 percent, you as the pilot in charge need to fix your problem. Your opinions are just that, opinions. They do not make things safer just because you have a different style of flying. The question is are you flying safe? Much of the problems you outline are simply based on unsafe flying. Why should DJI assist you in accommodating an unsafe flying style. Now, you are making assumptions that have not been verified. You have to test your theory that the RTH cannot be canceled immediately like you can with a P3. If your FW and updates are indeed up to date, I am sure the Inspire code is as good or better than the P3. See now there is a counter theory. When you look up your theory in the manual, be sure you use the new manual for the Inspire that came out two weeks ago. But you have to prove your point and you are not proving very much here except that you have opinions about how you like to fly. Well, I do not like your risky techniques and all your pushing things to the limit so you have to have your thumbs on live sticks at all times. I can handle the way DJI gives you plenty options real well. I am at least happy you have gotten past the black magic. Finally, you do not appear to have done your research before you bought your Inspire. In my opinion, you should have read the entire "current" manual before you bought the inspire like I did before I bought my P3P. Your preferred flying style conflicts with the DJI business plan. As the saying goes "caveat emptor". If you have not crashed, or trashed, your Inspire, you can still save your program at minimal cost or so I would theorize. DJI does not have to redesign and retool their entire program to accommodate you or me for that matter, because of our opinions. You are much better versed in the Inspire now than when you started and you will be a much better flier and flight instructor as a result. You are a very smart man with a lot of talent and creativity. Pull yourself up by your bootstraps and get out there and solve your problems - and fly! It is great for the mind and soul! "I would have hoped that you were intelligent enough not to have misunderstood my point. Please enter me into the "I don&apos;t care anymore" category. This is tantamount to one of those "...everyone knows..." arguments or, worse yet, calling someone names when they don&apos;t agree with you. You&apos;re repeating yourself. To clarify your argument, you&apos;re just stating the same thing again and again. Perhaps with some of the places you want to fly (your examples, not mine) perhaps you&apos;re trying to drive an 8-foot-wide car on a 6-foot-wide roadway! Sometimes it&apos;s far better to just say you agree to disagree. As opposed to "...methinks he doth protest too much." Just been testing on the sim. Set the RTH height to 30m - hover at 10m - the aircraft ascends to 20m without any stick control available, stops briefly, then ascends to 30m before flying to the home point. I have stick control between 20m & 30m altitude. There seems very little sense to me in the first ascent to 20m....what&apos;s it&apos;s purpose?? Why no stick control? Interesting discussion about the RTH process. Glad your asking some why&apos;s Paul. I&apos;ve wondered why the RTH accelerates at near full throttle? I don&apos;t like that either. I wonder if we had a solution to how it should work if DJI might adapt the procedure? I would think they listen here to feedback. Obviously, you drive an automatic transmission in your car and are not a die-hard British manual transmission fan. I drive a manual transmission in my car and have to take one hand off the wheel every time I shift gears. So is that dangerous? Not if you look at my driving record and history in transportation. Hands-on systems are designed to push it to the limit - like racing. Your arguments are for the drone racing world with paddle shifters on the steering wheel - not the drone photography and research world. You are out of your league here again. You refuse to recognize that yours and others risky approach to flying is why you are having problems. My efforts with your posts here in this forum are only to try to explain to you why you keep spinning out; and you have not even started the race yet. This is not a high risk race. This is a take your time and think it out endeavour. DJI has washed their hands of your suggestions because they represent a rejected approach to flying their product. The proper term here is "get a clue". You keep spouting off racing dictum under the guise of safety. Sure racing technology can be adapted to improve safety in the real world but the pace with which that occurs is dependent on the full spectrum of the marketplace - something all of your posts completely ignore. That is a key to why DJI ignores yours and some others suggestions and demands. DJI operates in a full-spectrum marketplace. Perhaps your problem can be best seen in parallel with your "stream-of-consciousness" response method in this forum. You take each statement or point made individually and attempt to rebut them individually. That way you can avoid looking at the whole picture, which is where you are failing in the discussion. The whole picture is the point of the discussion! At some point your stubborn effort to put a square peg in a round hole becomes a simple bid for attention and has nothing to do with quadcopter manufacturing and flying quadcopters. Have we reached that point yet? Have you noticed others in this "discussion" giving up in the face of your unwillingness to face reality and a willingness to spout dictum in a bid for attention. This usually indicates problems with an individual&apos;s personal life. You mentioned you are having problems getting your business off the ground and your vehemence toward DJI clearly indicates that you do not want to take responsibility for that problem. Now, it would be improper to get too deep into such problems because you probably have a really cool venture opportunity. Your comments in this "discussion" indicate a very high level of creativity and that only reinforces the suggestion that your venture will be seriously cool. I am reasonably sure that if you spent more time talking to your partners in your venture about the issues presented in accomplishing your goals rather than writing stream-of-consciousness comments in this forum, you would be on the road, not the race track, to solving your problems. This writing race track keeps bringing you back to the failed approach where you started and you stubbornly do not notice it like everyone else. It has been established for a long time that talking about a subject greatly increases the amount of "brain-power" you can put into a subject. That is why professors lecture. Speaking about a subject fleshes the subject out more thoroughly because you are now applying much more of the brain, the speech center, to the subject. Writing about it here is not the same thing because of the way the brain is set up. That is why you keep spinning your wheels. Does DJI even have a drone racing division? Yes, the Phantom 3 has this feature and many others. If you read the manual thoroughly, you will learn many of the cool features and that can help you look on this forum for more information. Then there are discussions like this one that get into the nitty-gritty. There are also a lot of DJI videos and DJI YouTube videos that really shed a light on how to do some things to help you understand how to get more than what you thought you could do with a Phantom 3. There are also independent YouTube videos that also provide interesting information. If you have not learned a lot about photography or filming with video, you are going to get an education here. It is amazing what these cameras can do. If it gets overwhelming, take your time and do short flights in a safe environment. Be very sure to find soft landing spots and practice your landings. This will be the most fun learning something you will probably ever have. The drone ascends up to 20 metres without pilot control for no apparent reason whatsoever. Yes, if you realise what&apos;s going on you can press the cancel button & wait for the slight delay before it cancels, but in a situation where you&apos;re under trees, every fraction of a second counts. Being able to overide the system via the sticks is by far the quickest reaction possible. If you want an automotive analogy, try cruise control. If you have it set at 70mph & the car in front suddenly brakes, you don&apos;t need to press the cancel button to stop. "Additionally, if I recall (I will check), the (Inspire) manual states that RTH cannot be cancelled until the aircraft has risen to over 20m. So did you check? Well, it appears that you are so intent on writing your own manual, that you have not even read or certainly do not remember that the Inspire 1 manual, from page 13 to page 16, states no less than five (5) times that RTH (all forms of RTH, no less) can be canceled by pressing the RTH (panic) button. Well, that greatly reduces my desire to read or help you by editing your version of an Inspire manual. Apparently, you do not do your research but instead make your arguments from bluster. Since the panic button is front and center, no matter how inconvenient that may be for your argument, the safety features you cry crocodile tears all over, are indeed not compromised at all. In fact, at a minimum, the RTH function acts as an advanced warning system to alert you of specific conditions that threaten safety. Potentially, if used properly, the RTH function can help the aircraft escape dangerous conditions, all while giving you control over the aircraft as long as there is communication between the aircraft and the remote control. The critical battery RTH function even allows you to try to hold the Inspire and P3&apos;s altitude by pushing the throttle up so you can further avoid obstacles on your inevitable path to the ground. Yes, I am a fan of excellent engineering and design. Sorry, but CheckMate, mate! So, remind me, what is the advantage of the drone flying itself without user control of the sticks? Paul, thank you for a calm, collected response. My respect for you has been re-established. Inherently, I feel I disagree with your perspective. Since we are all somewhat unique, that should not be considered unusual. It&apos;s also entirely possible that, by never flying exactly the same way you do, I see this issue from a totally different perspective. At a minimum, perhaps I don&apos;t see it at all from your perspective. Maybe we&apos;ll get lucky - DJI might transition from the existing RTH functionality closer to what you say you want - and that change either won&apos;t affect me or won&apos;t bother me! Good luck with your pursuit of your vision of a "better" RTH function. After your both frank and polite response, I&apos;ll be quietly rooting in the background. Not a bad idea, but bad for largest percentage of users. The reason input in disabled until rth height is enabled is two fold. 2. When aircraft goes into rth mode it may be some time before controller realizes it. Stick inputs are still occurring and an input indicating go down might be transmitted and reach the bird while others commands are failing to make it. During rth primary goal is make it home safely and number one obstacle physically is tall objects. For your challenge you can solve problem by setting your rth height very low. Set it back when needed. When at low height rth will allow up commands. In reply to point 1. - The pilot is required (& it is the law in many countries) to always have line of sight. Also, if they don&apos;t have line of sight, they&apos;re obviously happy to fly without it, so nothing changes at that point, they can still have the same visual information they had previously. & point 2. - This would be a problem with normal RTH above 20m. If you touch the throttle, it&apos;ll stop rising & fly directly towards the home point at whatever altitude that may be & it will almost certainly crash! Very well written Cetaman...instead of attacking, people might learn a thing or 2 if they read and keep an open mind. So, which of us do you think has the open mind, Marco Polo? Wow, is this second grade or what ??? The OP only tried to educate some of us new guys, and perhaps, prevent an expensive accident. What&apos;s wrong with that ? This thread is a disaster, one poster after another , trying to prove that he is smarter than the other guy. Good point. Some people have a problem with taking responsibility for their own actions and statements when it is pointed out. Mostly though, when people learn they have been making a mistake, they take actions to correct what they were doing wrong. That is why DJI Tim started this thread. Most people just want to know what went wrong and are not interested in making someone else responsible for their mistakes. Yes, I&apos;ve been planning to test that myself. In the sim it carries on for a couple of metres (can&apos;t remember how far exactly). I&apos;ll try & do it one lunchtime later this week if the weather gives me a break. Sometimes the user flies multiple flight modes with IOC. These are mostly autonomous and that leaves the flier able to control the camera with slightly more concentration. But, the flier still has to have situational awareness in order to fly safe. This is similar to autopilot in an aircraft. In the current context, the P3, or Inspire if you need, will alert the flier to a dangerous situation and initiate recovery. The incident can be with or without communication between the aircraft and the remote control. This is the Return to Home (RTH) feature. When there is communication, the flier is required to address the problem and may immediately resume control of the aircraft if that is determined to be the best option by the flier. Safe flying by the flier requires that the flier be aware of the RTH feature as it is represented in the manuals and to keep up to date with their manuals. In the manuals, it is repeatedly shown how the flier is in control of the aircraft and as a result needs to understand the limitations of the RTH system in order to fly safe. Overflying the RTH system as one would do with risky flying such as racing and entering dangerous flight spaces will obviously not be safe flying with the DJI RTH feature. For example, if the flier enters an unanticipated flight environment (Not safe flying in the first place!) in which a RTH is initiated, the altitude for the return has been set above an overhead obstacle and the flier fails to cancel the RTH feature by pressing the RTH (panic) button ASAP so the aircraft will hover (as long as the sticks are not pressed), then the flier is not complying with the proper use of the aircraft as provided in the manual. (You need to read the manual.) If the aircraft crashes into the overhead obstacle under these circumstances, it is the responsibility of the flier, not the manufacturer. The manufacturer provided a means to not crash into the overhead obstacle and the flier failed to use the means provided by the manufacturer. If the fliers aircraft, or other equipment purchased from the manufacturer, does not perform as provided by the manual, then it is the responsibility of the flier to initiate repair of the equipment. Flying the equipment without the repair or repairs is not safe flying as provided by the manufacturer&apos;s instructions. If a pilot does not wish to comply with the requirements of the safe flying environment as presented by the manufacturer, then they must not try to hold the manufacturer responsible for misuse of or failure to use the manufacturer&apos;s safe flying system. To do so is an attempt to deliberately promote an injustice. It is best that the rebellious flier find another product and a different flight environment. We can only hope that it is a safe environment. Wow...are you a politician? You&apos;ve either completely avoided or misinterpreted the question. What is the advantage of the drone flying itself without user control of the sticks? Please try to answer the question directly & in context, i.e. the first ascent to 20m when RTH initiates.